While not giving up all of the strong gains made during the week, global markets trended lower on Friday with the Dow coming off 0.2% to close at 12,940 points and the NASDAQ falling slightly, closing at 6047 points. Given there were some stellar surges in the Dow in the early part of 2017, the fact that the week just gone was the best to date with a gain of 1.9% demonstrates the degree of confidence remaining in equity markets. This has mainly been supported by an impressive earnings season where there have been more beats than underperformances, suggesting that there could be more momentum in the last two weeks of reporting season. 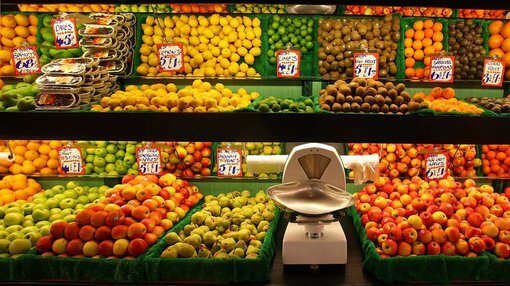 In Europe though, figures released by Eurostat regarding core inflation for energy and food reflected an inflation rate of 1.2%, a four year high and above consensus of 1%. This appeared to impact the FTSE 100 as it came off 0.5% to close at 7203 points. However, the DAX and Paris CAC 40 were relatively unaffected with declines of less than 0.1%. They closed the week out at 12,438 points and 5267 points respectively. On the commodities front, oil regained some ground, hitting an intraday high of US$49.76 per barrel before closing at US$49.19 per barrel. Despite being sold down from circa US$1280 per ounce levels amidst the surge in equity markets during the week, there is still support for the precious metal as it closed just shy of US$1270 per ounce on Friday. Iron ore also made a comeback of sorts, gaining nearly 4% to US$68.80 per tonne. There was strong support for base metals with lead leading the way as it gained nearly 2%. Nickel was also impressive gaining more than 1% to close at its high for the week of US$4.26 per pound. Zinc rallied nearly 1%, and its close of nearly US$1.19 per pound represented the top end of a three-week range it has traded in post a sell-off that occurred in late March/early April. Copper also finished at its highest level in approximately three weeks, closing at circa US$2.59 per pound. With copper having now strung together five gains out of the last seven trading days there appears to be some confidence showing through which is normally a good guide to the performance of other base metals. It is worth noting that the timing of this positive momentum coincides with a noticeable decline in 30 day London Metals Exchange copper warehouse stock levels. Zinc is the other metal to watch in terms of inventory levels. 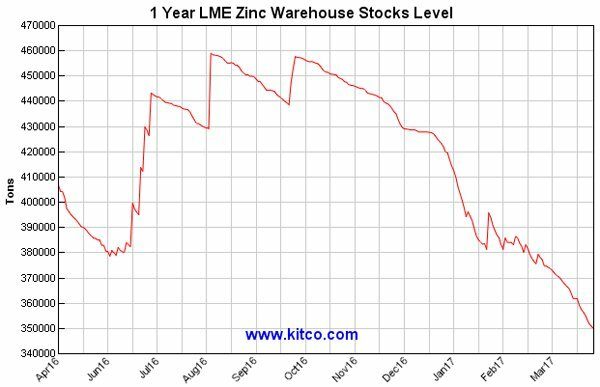 The decline in one year LME zinc warehouse levels from circa 460,000 tonnes in mid-2016 to approximately 380,000 tonnes in January was a significant fundamental underpinning the metal’s increase from approximately US$0.90 per pound in mid-2016 to more than US$1.30 per pound in January 2017. This sharp decline was arrested in February/March, triggering a retracement in zinc prices. However, it has resumed in April and appears to be accelerating with warehouse levels now hovering in the vicinity of 350,000 tonnes, the lowest they have been in more than five years.